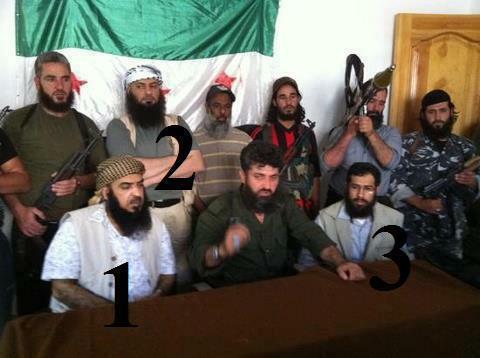 Bahraini Salafis boastfully engaging with Syrian rebels in August 2012. What could possibly go wrong? The inevitable political blow-back of the sectarian agenda employed by Bahrain and to a lesser extent Saudi Arabia and other Arab Gulf states since 2011 has remained a common theme of this blog. Forestalling change by instilling in citizens not simply a violent opposition to political reform as a specific policy choice, but a visceral hatred of the actual reformists themselves, is a decidedly short-term strategy, and it seems that we're now nearing an inflection point. The local political and communal implications of Bahrain's sectarianization of politics have always been clear enough: the deepening of distrust between Sunna and Shi'a, the rise of violent opposition movements, and the marginalization of moderate factions both within the government and society. But with the meteoric rise of Da'ish in Syria and Iraq, and the free operation of similarly-oriented groups based in the Yemen, these implications are no longer limited to the political and societal. Rather, Bahrain's deliberate incubation of Sunni radicalism is transforming now into a foremost security problem for the Al Khalifa. As described in an article published on Thursday titled "Bahrain's Daesh Dilemma" (and before that in a piece by Ala'a al-Shehabi in Foreign Policy), it turns out that Bahraini nationals count among several senior members of the so-called Islamic State, including the main theological apologist for Abu Bakr al-Baghdadi and his claim to the Caliphate. Not only this, the article tells, but many of these individuals are or appear to be former members of and/or defectors from the Bahraini security forces, which one will recall are composed primarily of non-national Sunnis from Yemen, Syria, Pakistan, and elsewhere due to concerns over what might happen if you allow Shi'a to have weapons. Well, it turns out that Bahrain must also now concern itself with the opposite case, i.e. what happens when you give weapons to radicalized Salafis recruited from countries infiltrated by terrorist organizations. For it is not just heretic Shi'a, but also the ruling family itself, that are the targets of the latter. In this context it is instructive to consider another piece published on Thursday, a commentary by Saudi Prince Turki al-Faysal in which he endeavors to give Da'ish "a new name," namely "Fahesh" (obscenity), to better reflect the reality of the organization. The article is a remarkable feat of cognitive dissonance, with Prince Turki managing to describe chronologically the rise of the Taliban, al-Qa'ida, Da'ish, and other Wahhabi-oriented terrorist groups without once mentioning their origins in the Wahhabi ideology exported for decades -- still being exported -- by the Saudi state, an ideology that features very few doctrinal differences from than being employed in, say, today's IS-controlled Mosul. Indeed, in Prince Turki's Bizarro World telling, it is Iran, not Saudi Arabia, that is culpable for the scourge of Salafi jihadism(!). And perhaps Saudi Arabia will then take credit for creating Hizballah and the Mahdi Army. Of course, it is no secret that the very existence of Saudi Arabia owes to a pragmatic marriage of politics and religion, and that accordingly it cannot afford to alienate the conservators of the monarchy's legitimacy and stability. It, like Bahrain, continues to bet on its ability to externalize the costs of the Sunni radicalization for which it itself is primarily responsible. One just hopes for its sake that IS militants don't learn how to climb fences. Either due to their affilations with ISIS or due to migrating to Qatar. Can we have some updated information on Bahrain?